We would Like to meet anyone with a classic or retro style looking scooter who are interested in shows, ride outs and rallies. 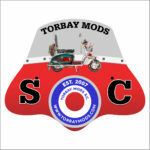 You don’t have to live in Torbay to be a member of Torbay Mods SC as long as you own a scooter or will be a pillion on a members scooter you can can join us now and again for ride outs etc. Regular club text messages keeping you up to date with events! Organised club ride outs with free club breakdown recovery (up to 30 miles from Torquay)!